This is the third night I’ve made a new meal that we haven’t had before! And this is the third night that I haven’t gotten any complaints from the family. I have even gotten the “this is pretty good” from a certain picky person! Yay me! I wasn’t sure if this could be considered a meal or a side dish. I consulted with my other “Girl” and she said it depended on how much ham was in the dish. Since it had a pound of cut up ham I decided that it was going to be our main course served with some green beans. This went over well. By preparing this tasty casserole with BREAKSTONE’S FREE or KNUDSEN Fat Free Sour Cream and 2% Milk VELVEETA instead of the full-fat products, you’ll save 40 calories, 6.5 grams of fat and 4 grams of saturated fat per serving. I didn’t use that brand of sour cream, but I did use the fat free/lite. I did use the Velveeta instead of full fat cheese. I’m amazed at how much fat gram were saved. The calories aren’t the important part to monitor for me, as yo know, but the fat intake. So if I can save that way, it’s good for me. 4 green onions, sliced – I left out the onions due to family dislikes – I would have liked it! 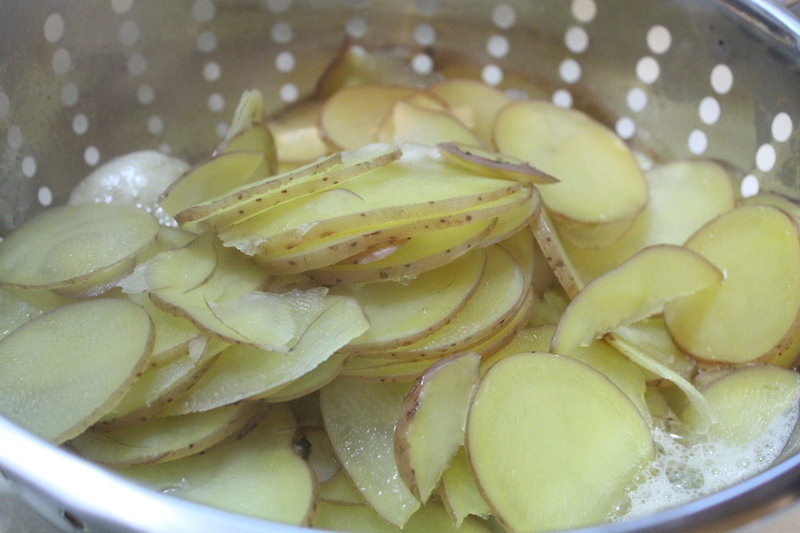 COOK potatoes in boiling water in large saucepan 10 to 12 min. or just until potatoes are tender; drain. Remove 3/4 of the potatoes; place in large bowl. Add sour cream; mash until smooth. Stir in VELVEETA, ham and onions. Gently stir in remaining potato slices. SPOON into 13×9-inch baking dish sprayed with cooking spray; sprinkle with Parmesan. This was another hit! 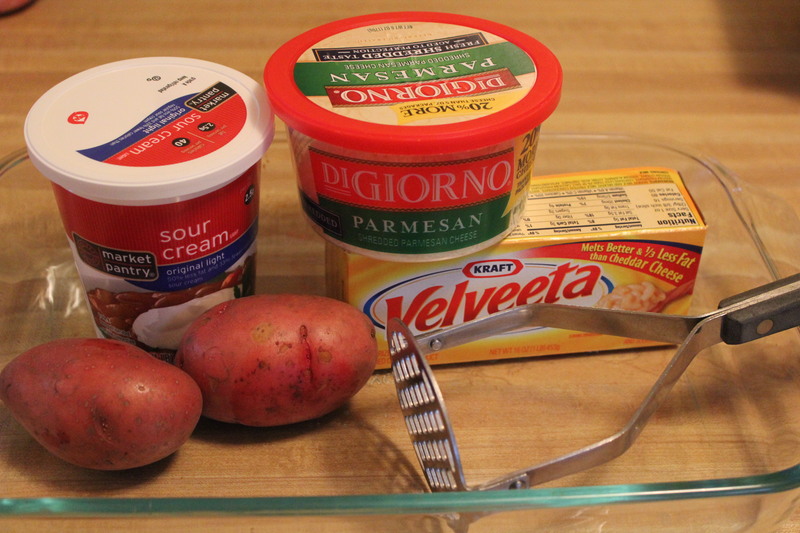 The cheesy potatoes were so good and did well as a main dish! The ham filled us up perfectly! I told my other half that the last few meals have been healthier versions and I know he can’t tell the difference. He just asked when he could have rice again for dinner! My mom called me last week and tried to order a pizza for delivery. She says it’s not fair to post all these recipes and pictures and she doesn’t get to eat any. So this weekend I decided I would make dinner for my family, and talked my sister Jamie into helping. We decided to make these Cheeseburger Buns I found in a Taste of Home magazine, with a few minor changes. It seemed like it would be a fun one to make with kids, and the taste is very kid friendly too. My sister enjoyed kneading the dough, though it was pretty sticky business at first! She also had fun rolling out the dough and pinching it together over the fillings. In a large bowl, dissolve yeast in warm water. Add the milk, sugar, shortening, egg, salt and 1 1/2 cups flour; beat until smooth. Stir in enough remaining flour to form a soft dough. Turn onto a floured surface; knead until smooth and elastic, about 6-8 minutes. Place in a greased bowl, turning once to grease top. Cover and let rise in a warm place until doubled, about 30 minutes. Meanwhile, in a large skillet, cook the beef, onion, salt and pepper over medium heat until meat is no longer pink; drain. Add cheese; cook and stir until cheese is melted. Remove from the heat. Punch dough down. Turn onto a lightly floured surface; divide in half. Roll each portion into a rectangle about 12-in. x 8-in. ; cut each into six squares. Place 1/4 cup meat mixture in the center of each square. Bring corners together in the center and pinch to seal. Place 2 in. apart on greased baking sheets. Bake at 400° for 9-11 minutes or until lightly browned. Brush with butter. Serve warm with your favorite cheeseburger toppings. I was impressed with the flavor and texture of the bun, it was nice and soft just like a hamburger bun. Since we used the rapid rise yeast the dough was ready by the time the filling was cooked. The filling was pretty simple and definately hit the spot for a cheeseburger craving. My mom called and said she thought these would be good to try with sloppy joe filling. I think that she means I should come over there and try it!